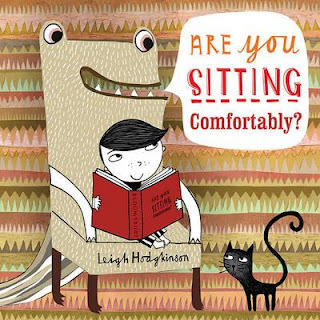 Kids' Book Review: Review: Are You Sitting Comfortably? Review: Are You Sitting Comfortably? Yay! Another Leigh Hodgkinson book! I so love it when she decides to produce more. Thank you, Leigh. In Are You Sitting Comfortably? (love the title), we meet a young lad who just wants to sit and read a book (hallelujah!). But the issue is that he can't find anywhere to sit that's not too fuzzy, dim, buzzy, stinky, grimy or even slimy. Just a quiet, comfortable place to sit is all he needs. Not too hot and not too cold would also be fantastic. Do you think he can find it? Things are not looking too good. Until he has a tiny revelation with a large impact (as is often the way). I love the beautifully-crafted messaging in this book. The rhyming, succinct text, is deliciously-penned, with a charming and unique voice that kids will resonate with. The illustrations are typically divine, and I love that Leigh changes up her imagery in her books, trying out new styles, colours and textures, that give a lovely varietal flavour to her body of work. Although there is a general cohesion to her styles, I love seeing illustrators mix it up. Quite literally, too. Are You Sitting Comfortably? is a great book to shout aloud to a pile of squirming school kids, sing-song read with a toddler on your knee ... or squirrel away on your own, with a lovely cup of tea, and not a child in sight.